3830 is in charge of the Up Riverina Express passenger service as it makes its regular stop at Goulburn Station. 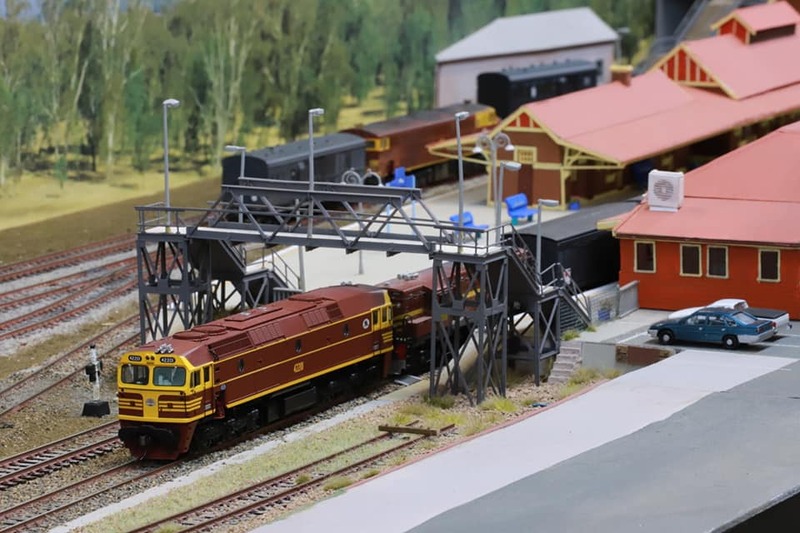 3830 is a DJH kit and the passenger cars are a Casula Hobbies RUB set. 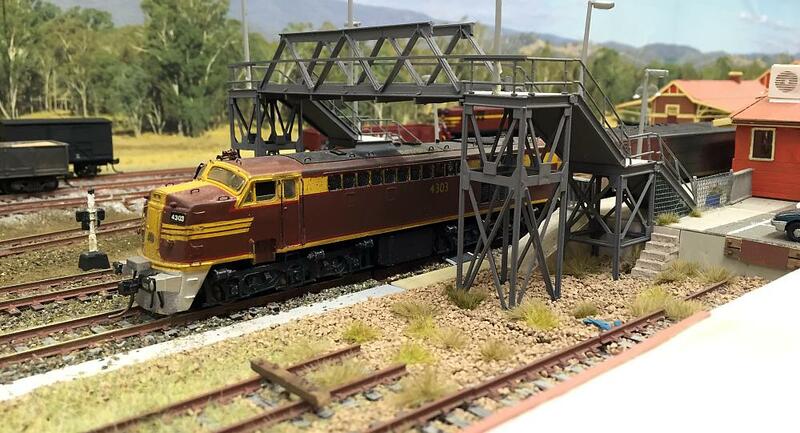 The footbridge is a heavily modified Kibri kit. Double 82 class locos rumble through the southern end of Goulburn Station, past the disused dock platform and staff carpark. Both 82s are Bergs white metal body kits on Athearn chassis. On the platform the lights are from Uneek Models and the station sign is constructed from styrene rod, sheet and strip. The name was taken from a digital photo of the original. 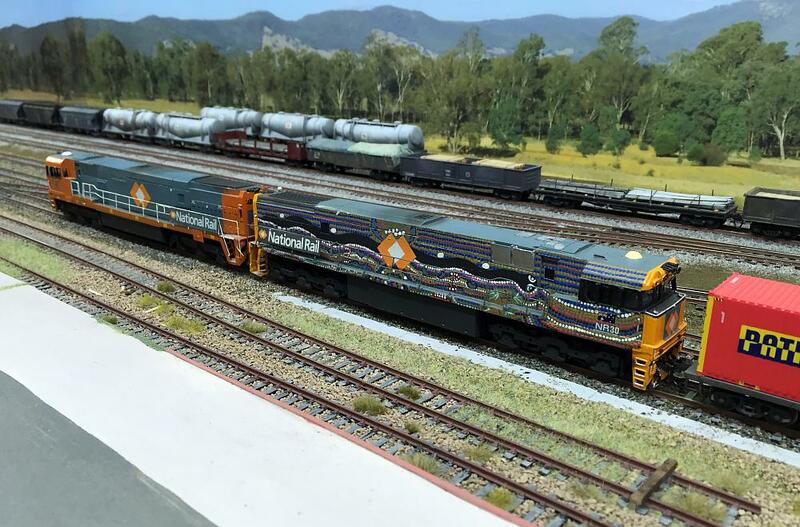 Class leader 42201 and sister unit 42205 are at the front of a Sydney bound perishables train full of fruit and vegetables from the south. The two locos are from Auscision. 4303 and a 4471 sit in the Up platform at Goulburn at the head of a goods train waiting to get the green signal to continue on their journey to Sydney. 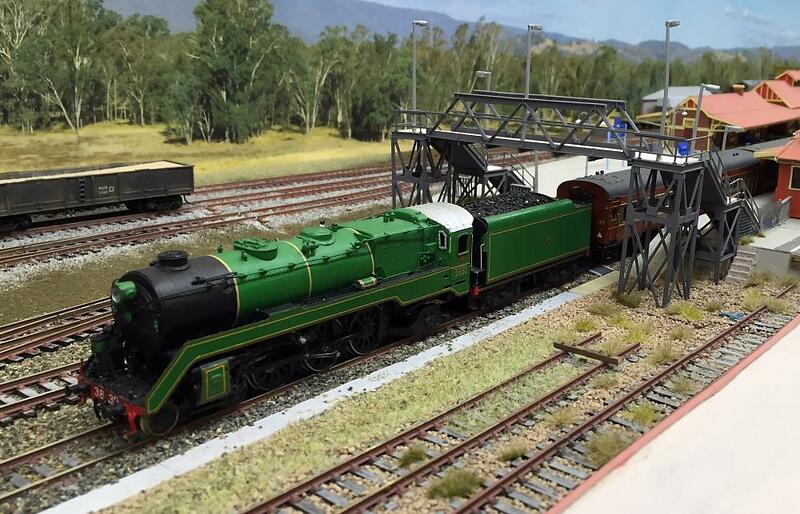 The 43 class is a Lloyds kit with Athearn bogies and Mashima motor on a scratchbuilt brass chassis. 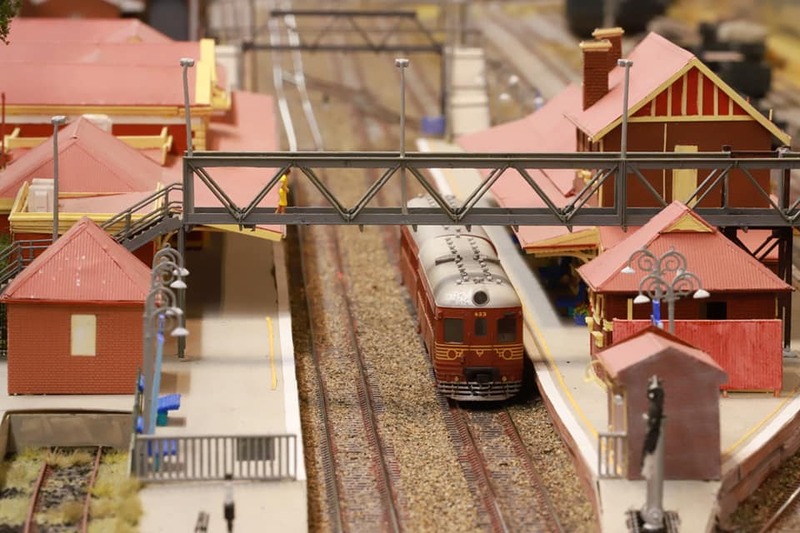 The 44 class is a TrainOrama model, renumbered and repainted in reverse tuscan livery. National Rail NR1 leads NR30 in indigenous colour scheme through the north yard at Goulburn with a container service to Sydney. Both locos are scratchbuilt and handpainted and run on Athearn chassis'. Parked in the yard are a myriad of wagon types for grain and cement plus open and flat wagons loaded with general merchandise. 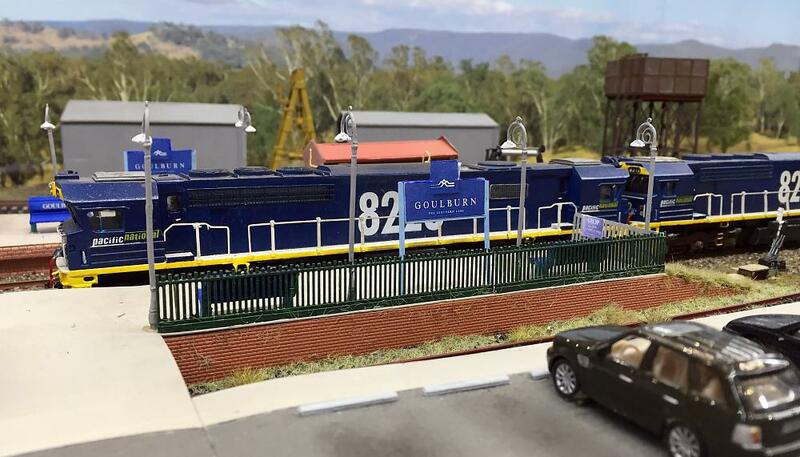 A local passenger service provided by a 620/720 railmotor set has terminated its journey at Goulburn station, and will soon depart in the direction it arrived. Garratt 6039 wastes no time in hauling a Down goods through Goulburn, the wagons destined for unloading and loading further south. 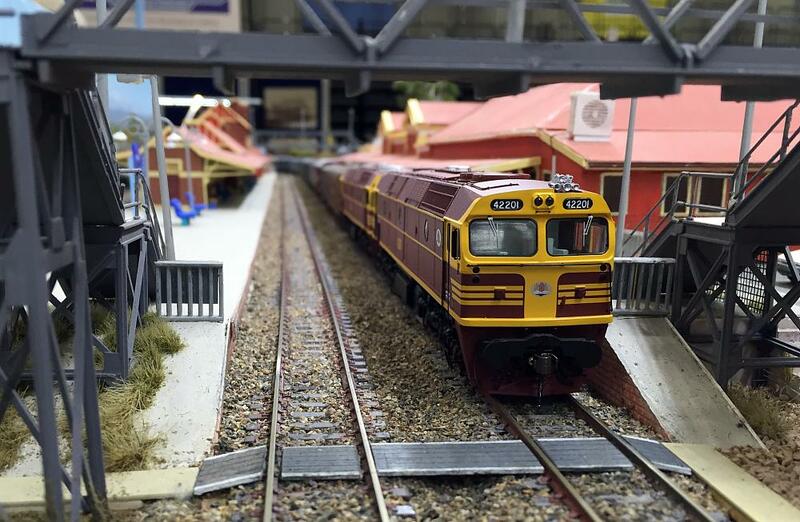 42201 and 4899 combine to lift an Up freight laden with fresh produce and perishables towards the markets of Sydney. 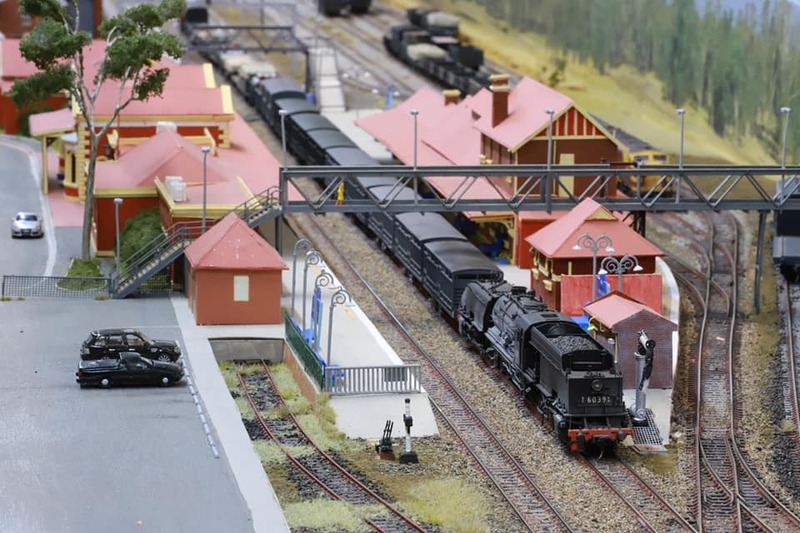 In the background, diesel 4429 and an MHG guards van await their next duties.